The ultimate blue collar guitar, the Telecaster launched a musical revolution when we released it. Quickly adopted by working guitarists who were enamored with its trend-setting sound, feel and unique style, the Telecaster laid the foundation for modern country, blues and even heavy metal (in Jimmy Page’s hands). 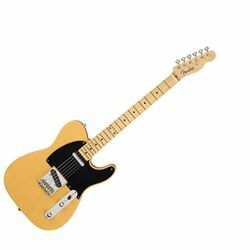 The American Original ‘50s Telecaster has all of the authentic Fender touches that made the Telecaster a star of the studio and stage, adding modern feel and pickup switching to this classic guitar.